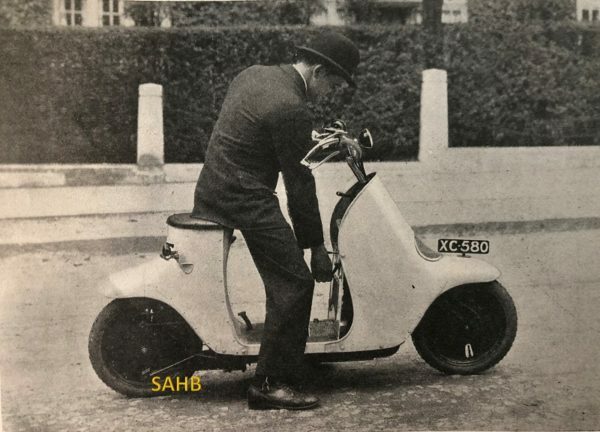 This remarkable scooter would appear modern and stylish today – but in 1920 it must have caused a sensation. The Unibus Scooter was manufactured by The Gloucestershire Aircraft Company Limited (from 1926 known as Gloster Aircraft Company). With aircraft production in severe decline after the First World War, the scooter was an attempt at diversification of the company’s products. It was designed by Harold Boultbee and marketed as ‘the car with two wheels’. Our picture appeared in the September 11, 1920 issue of The Field (The Country Gentleman’s Newspaper) – and the scooter was advertised at the same time in the motorcycling press and in other more mainstream magazines such as Punch. The gentleman in the bowler hat in our image also appeared in at least one Unibus advertisement. The target market for this machine was clear to see. The editorial staff of The Field were not greatly impressed by motor scooters in general. They had welcomed the idea of these vehicles (the Motoped of 1915 being one of the first of these “step-through-frame machines) as “something that might, with enthusiasm, be developed into a machine midway between the £85 motor bicycle and the pedal bicycle for those who desire simply to potter about.” But by 1920 they considered that little progress had been made. They were, however, impressed by the Unibus, with the reservation that its price, at 95 guineas, would be “too high to attract popularity”. The most important advantages accepted by The Field and vaunted in advertisements were the disposition in a very small space of most of the mechanical elements of a motor car, including 2½ h.p. 2-stroke motor, gearbox, flywheel, clutch and shaft drive, the pressed steel frame, and the handsome aluminium body mounted upon it, providing “complete protection from the road for both rider and mechanism in any weather”. Its long quarter-elliptic springs and large cushioned seat made for a comfortable ride. The question of elevated price seems to have hastened the death of the Unibus, and fewer than 100 are thought to have been made. Harold Boultbee, its designer, stayed in the aircraft industry but sadly involved himself in a number of ventures that ultimately failed – such as the The Civilian Aircraft Company between 1928 and 1933 to make a two-seat light monoplane, and the The Pobjoy Pirate of 1935, a three-seat, high-wing monoplane designed to compete with the De Havilland Leopard Moth and abandoned when flight tests showed it to be uncompetitive. Fortunately, Boultbee’s scooter design can still be seen today. Motorcycle enthusiast Mike Webster from Romney acquired what is thought to be one of only three Unibuses in existence and has fully restored the rare vehicle to roadworthy condition. In 2014 it made the journey to the new Jet Age Museum at Gloucestershire Airport, where it can be seen on display in a glass case – with a bowler hat on the seat!